Nepal as part of the Global SUN Movement Nepal is a Scaling Up Nutrition (SUN) Movement early riser – the fifth country, joined the Movement on 5 May 2011 with a letter of commitment for scaling up nutrition by catalyzing collective action to end malnutrition in the country. Nepal has shown its commitment by its action by bringing people together; developing coherent policy and legal framework; aligning programs around a common results framework; developing periodic financial tracking and results framework; further strengthening political commitments. Nepal has followed the steps of SUN Movement‘s roadmap as a space to engage, inspire and invest by convening, mobilizing, sharing, learning, advocating, aligning and coordinating Nutrition actions. Stunting among young children still remains unacceptably high and remains the unfinished business from the MDG Era. Stunting has declined steadily over the last 17 years; it was 57 percent in 2001, 49 percent in 2006, 41 per cent in 2011, 37 per cent in 2014 and 36 per cent in 2016/17 based on Nepal Demographic and Health Survey (NDHS), 2016. A new and refreshed momentum for nutrition in Nepal has been gathered through the World Health Assembly (WHA) targets for 2025 and the SDG targets for 2030. 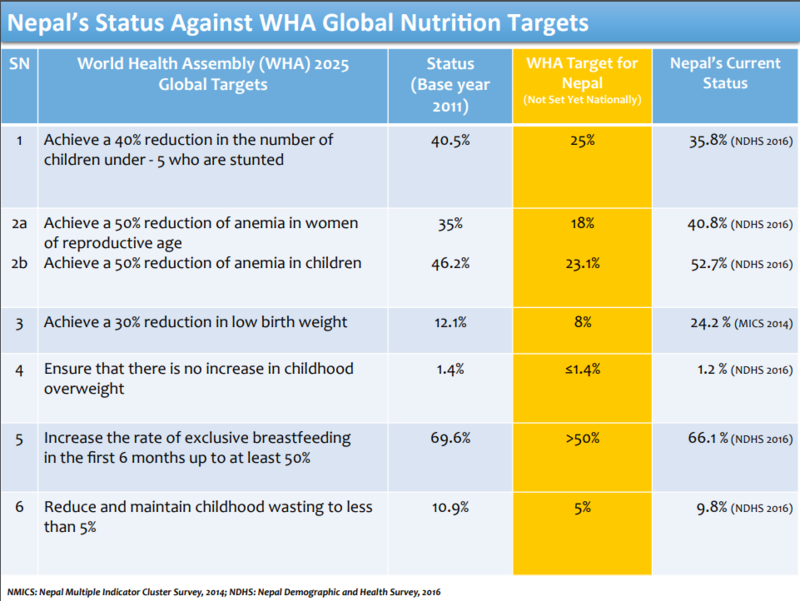 Nepal has set the Nutrition WHA target for 2025 at 24 per cent for stunting and at 15 per cent for SDG target as shown in table 1 below. Nepal needs to increase the current average annual rate of reduction (AARR) of stunting from 3.1 per cent to 4.3 per cent to meet the WHA 2025 target (NDHS 2001, 2006, 2011, 2016 and NMICS 2014). There is still a marked disparity in stunting by gender, wealth quintile, and level of maternal education, geographical areas and caste/ethnicity as shown in figure 1 below. The children who are from the poorest wealth quintile are three times more likely to be stunted (49.2 per cent) than the children from the richest quintile (16.5 per cent). The children from the mothers who are not educated are twice likely to be stunted (45.7 per cent) than the children from the educated mothers i.e. S EE (School Education Examination), previously SLC (School Leaving Certificate) (22.7 per cent). The children of age-group below 18 years are less stunted and below the national average as compared to the children above 18 months of age. Children from the mountains are 45 per cent and 27 per cent more likely to be stunted (46.8 per cent) than the children from the hills (32.3 per cent) and terai (36.7 per cent). 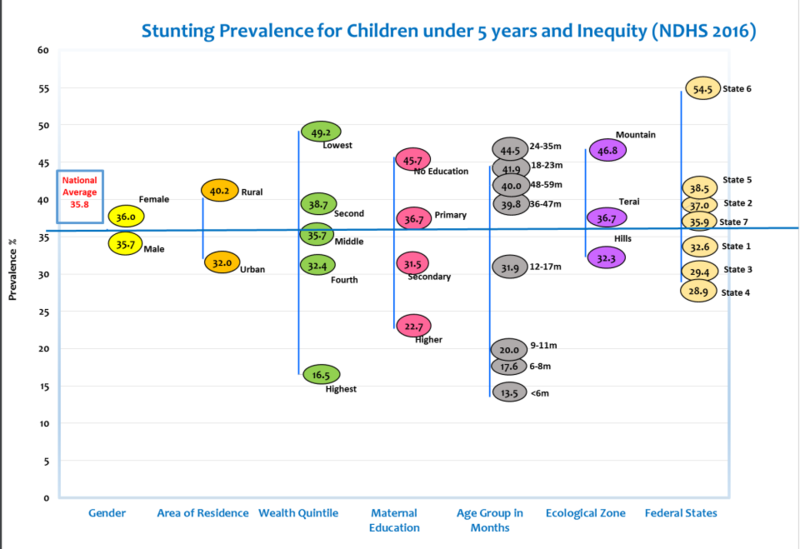 As per the federal structures, Province 2, 5, 6 and 7 have prevalence of stunting above the national average, and Province 1 and 3 and 4 have less prevalence compared to national average. Particularly, the stunting prevalence is the highest in State 6 (54.5 per cent) which is almost double than the prevalence in Province 4 (28.9 per cent) which is the lowest among the provinces. The disparities and inequities on Nutrition need to be addressed by MSNP II. Nepal has seen significant economic improvements over the last decade and half. The poverty situation declined from 40 per cent in 1995/96 to 25 per cent in 2010/2011 (Nepal Living Standards Survey – NLSS). However, Nepal still remains one of the least developed countries in the world. Nepal’s HDI value for 2015 is 0.558— which put the country in the medium human development category— positioning it at 144 out of 188 countries and territories. Between 1990 and 2015, Nepal’s HDI value increased from 0.378 to 0.558, an increase of 47.7 percent (HDI, 2016). The preliminary estimate of GDP per capita of Nepal stands at US$ 1004 for the fiscal year 2017/18 (Central Bureau of Statistics, Nepal, 2017). 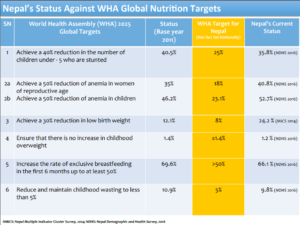 What is at stake if Nepal does not reduce malnutrition? If Nepal does not improve nutrition status of children and adolescents it will neither graduate from LDC nor repeat its demographic bonus before becoming an aging population. Nepal is a signatory to the Declaration of Istanbul Program of Action (IPoA), and committed to graduate from least Developed Country (LDC) category by 2022. For Nepal to graduate from a LDC category, there are three criteria namely, (I) improve income (II) improve the Human Asset Index (HAI) (III) reduce Economic Vulnerability. Nutrition contributes to all the three components of HAI. 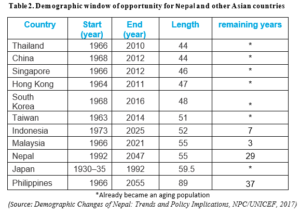 As shown in Table 2, Nepal will become an aging population in the next thirty years, having greater than seven per cent of the population over the age of sixty five years (Demographic Changes of Nepal: Trends and Policy Implications, NPC/UNICEF, 2017). In order for Nepal to reap the demographic dividend within the next thirty years of ―Demographic Window of Opportunity‖, Nepal has to urgently invest in reducing malnutrition and increase its investment in social and human capital development focusing on; (I) children under five years of age and (II) adolescents. 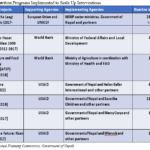 The figure 2 below shows the timeline of nutrition policies in Nepal from 1978 to 2022. The Government of Nepal (GoN), starting from 1978 initiated the National Nutrition Strategy that was followed in 1986 by the Second Nutrition Strategy also known as the Pokhara Declaration I and II. These earlier policy strategies were very single sector driven. In 1989-1992, the first attempt at multi-sectoral nutrition programming was made through the Joint Nutrition Support Program (JNSP). The JNSP despite its efforts at multi-sectorality still lacked engagement of sectors during its inception and thus could not become effective. In 2004, the National Nutrition Policy was developed by the health sector again a single sector response. 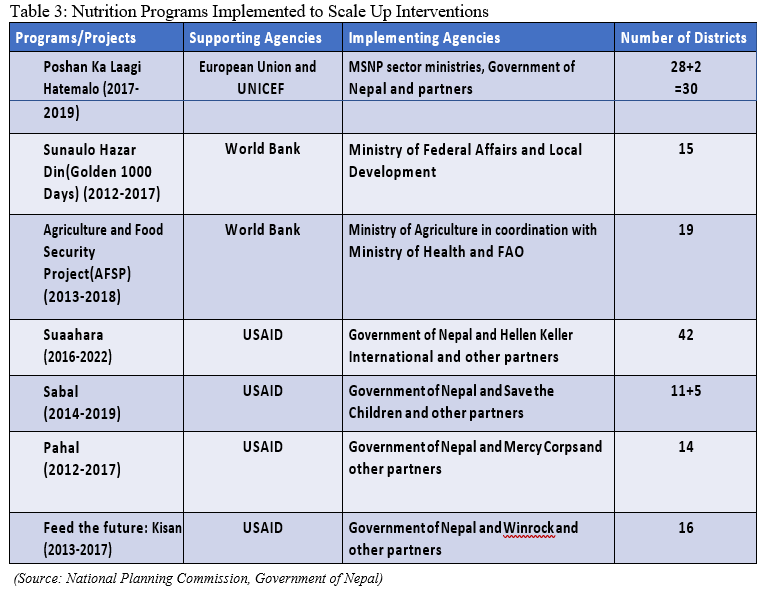 In 2011 the Nutrition Assessment and Gap Analysis (NAGA) was carried out and was endorsed by the National Planning Commission (NPC) leading to development of the Multi-Sector Nutrition Plan in Nepal covering period 2013 to 2017 with full engagement of other sectors and also having a national coordination mechanism and leadership by the National Planning Commission. Building on the lessons learnt from MSNP I the MSNP II covering period from 2018 to 2022 was approved by the Cabinet in November 2017. The MSNP II sustains the best practices from MSNP I while also adding new emphasis in order to achieve Nutrition SDG targets for Nepal such as; I) Gender Empowerment and Equitable focus on those populations disproportionately affected by malnutrition, II) life cycle approach starting with the Golden 1000 days, III) forging a strong relationship with the 753 local authorities under the on-going Federalism and we have developed a special directive on MSNP operationalization within Federalism approved by NPC, IV) stronger emphasis on monitoring and accountability for implementation. 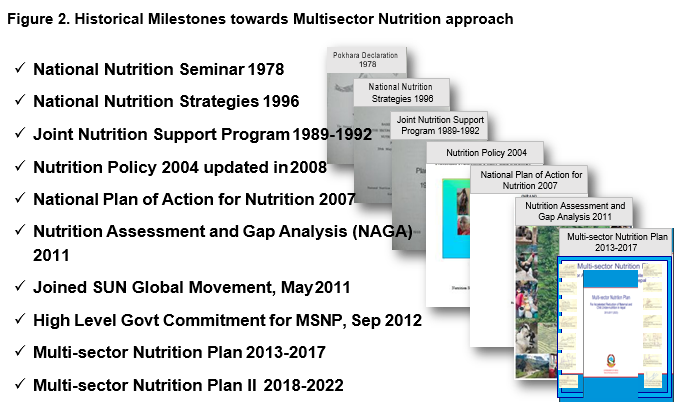 The table 3 shows the nutrition interventions implemented during MSNP (2013-2017) and also continue during MSNP II (2018 to 2022). The initial implementation started off as a pilot in six districts of Nepal namely Bajura, Achham, Jumla, Kapilvastu, Navalparasi and Parsa and has since been scaled up indicating a remarkable response to the Scaling Up Nutrition Movement. 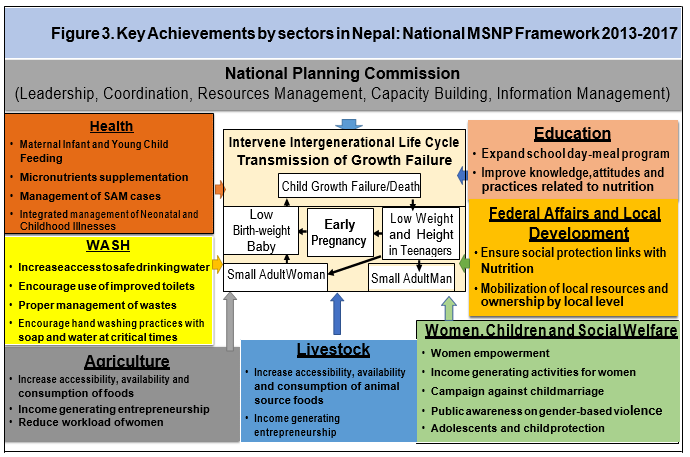 The figure 3 shows some of the key achievements by sector Ministries that are part of the MSNP implementation in Nepal. The Government of Nepal‘s annual expenditure for Nutrition more than tripled from USD 49.7 in 2013/14 to USD 110.2 in 2016/2017 and USD 185.80 in 2017/18. The establishment of an effective Nutrition coordination architecture at national level, province level, district level, and municipality level and ward level characterized by High Level Nutrition and Food Security Steering Committee and National Nutrition and Food Security Coordination Committee and followed by Regular Dialogue with Parliamentarians, UN Agencies and Development Partners, Multi Sector Technical Working Groups, Academia Platform, Civil Society Alliance for Nutrition, Private Sector Platform, and Media Network. The development of National Nutrition and Food Security Portal, which is a digital database for all MSNP related guidelines, studies, policy documents, and mapping of stakeholders. Building on the lessons learnt from MSNP (2013-2017), the Government of Nepal through the leadership of the National Planning Commission with the technical support of EU/ UNICEF, USAID, SUAAHARA, World Bank, WHO, WFP, FAO and Civil Society Organizations, formulated and developed Multi Sector Nutrition Plan II (2018-2022), which was endorsed and approved by the cabinet of ministers of the Government of Nepal on 19 November 2017.The process of developing MSNP II (2018-2022), was participatory and based on results based strategic planning approach. The estimated cost of implementing MSNP II is US$ 470 million, with the government providing 59 per cent of funds and development partners 41 per cent. To end malnutrition in all of its forms, the Government of Nepal has shown its unprecedented political will and commitment towards the SUN Movement by endorsing and approving MSNP II (2018 – 2022), to leave no one behind, achieve the goals and targets of SDG 2030, WHA 2025, LDC graduation by 2022, 14th Three Year Periodic Plan (2016-2019). 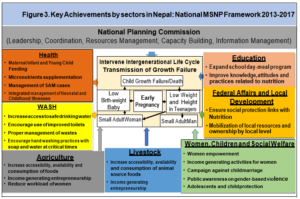 The SUN Movement contributed towards the launching of Nepal Nutrition and Food Security Portal (NNFSP) by National Planning Commission (nnfsp.gov.np) as the NPC led multi-sector and multi-stakeholder platform for nutrition. The NNFSP is a digital database for all MSNP related guidelines, studies, policy documents, and mapping of stakeholders. The MSNP II (2018-2022) states utilisation of the portal as the multi-sector monitoring and reporting web-based platform. * Prof. Dr. Geeta Bhakta Joshi is SUN Movement Nutrition Champion 2017, Former Member, National Planning Commission, Government of Nepal. Stanley Chitekwe is Chief of Nutrition, UNICEF, Nepal. On 14 December, the Govt of #Nepal launched the Multisector Nutrition Plan (MSNP) II, targeting women, children & adolescent girls in the country.